Hosted PBX. Virtual PBX. Cloud PBX. Hosted PBX. Virtual PBX. Cloud PBX. What does it really mean? Instead of that ungainly PBX box in the telecom closet, 8x8 delivers all hosted PBX phone services right over your Internet connection using VoIP technology. With 8x8, your virtual PBX phone service is affordable, simple to manage and gives your whole company access to enterprise-class features that other providers charge extra for. 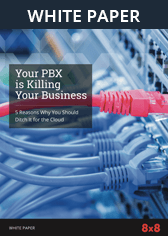 Lose the big box and the big fees—No need to buy, lease, or pay maintenance fees on a complex PBX system at your office; your hosted PBX solution is delivered right over your Internet connection. Save a lot—We usually save businesses about 50% off their phone bill and up to 90% off what it would cost them to invest in a traditional PBX system. Simplify with one company—Get everything you need from one company: your phones, all your calling features, and your local, long distance and international calls. 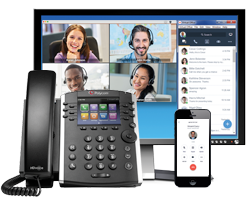 Put all employees under the same phone system—Distributed locations, office workers, home-based employees and traveling staff all share the same virtual PBX features; so no matter where they are located, they are only an extension call away from each other. You get an amazing business phone system that works exactly like you would expect it to. But it’s virtual. All you need are phones and an Internet connection. Meanwhile, we own and manage all the virtual PBX equipment, software, and upgrades behind the scenes so you don’t have to. Learn more about 8x8 Virtual Office, our hosted PBX service.